Figuring out a packing list for spring and early summer travels in Europe can be tricky– temperatures can vary so greatly you may not be sure what to wear and can easily result in that dreaded over packing. I am obsessive about packing light (more room for souvenirs!) so I keep my packing list for travel outfits minimal and versatile. 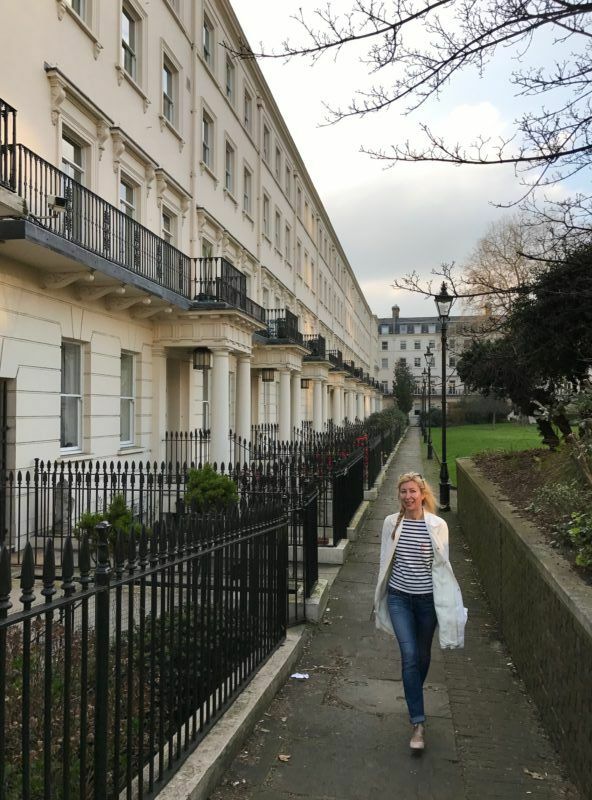 For this post I am focusing on creating an easy packing list for a vacation in London and Paris (similar European capitals that are cosmopolitan with pretty much the same climate). 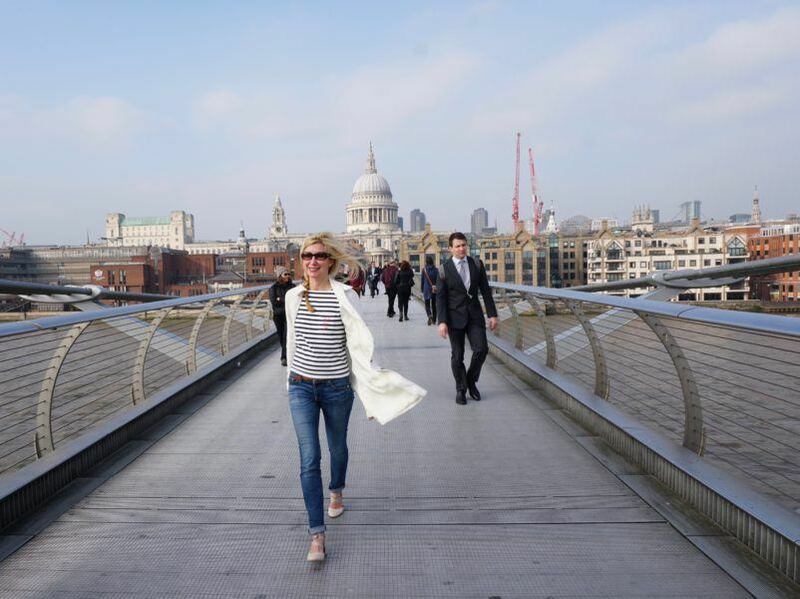 While Paris is of course well know for its stylish women, London is no slouch either, so you’ll want to be dressed well no matter which city you pick. And if you’re like most American travelers, you might you might even be visiting both on the same vacation (with the ease of the Eurostar, it’s a no brainer to fit the other city in). My women’s clothing packing list for London and Paris is made up of all classic items. I prefer to dress in classic styles when I travel so my photos don’t look dated. There is nothing worse than looking back at your photos and cringing every time you see that peplum top or gaucho pants. If you stick to basic styles, with simple lines you really can’t go wrong. From March through June, chances are you’ll need to pack some kind of jacket for your London and Paris vacation. Even if you’re lucky with warm European days, evenings can be chilly. Fortunately, jackets are an easy way to pull your entire travel outfit together. A great jacket can make an outfit look more finished than on its own. If you’re going to focus on buying one new item for your trip, make it a really great jacket or lightweight coat. Keep in mind that depending on the weather, the jacket may be featured in most if not all of your outdoor photos– so pack a jacket that looks good in photos! Your carefully chosen outfits underneath might not even be seen. Stick with simple jacket styles– they will be easier to coordinate with the rest of your vacation wardrobe. It’s rarely worth it to bring a great jacket that only works with one outfit (unless you have a special evening event that requires it). 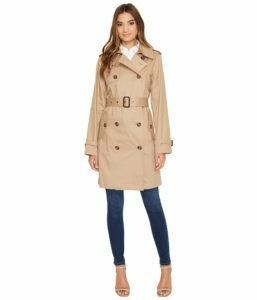 A classic trench coast looks great on most people and always makes my London and Paris packing list. While khaki is a classic, nowadays you can find trench coats in all colors. Pick a color that will blend with your wardrobe. I would stay away from prints, they just look too busy for a coat. 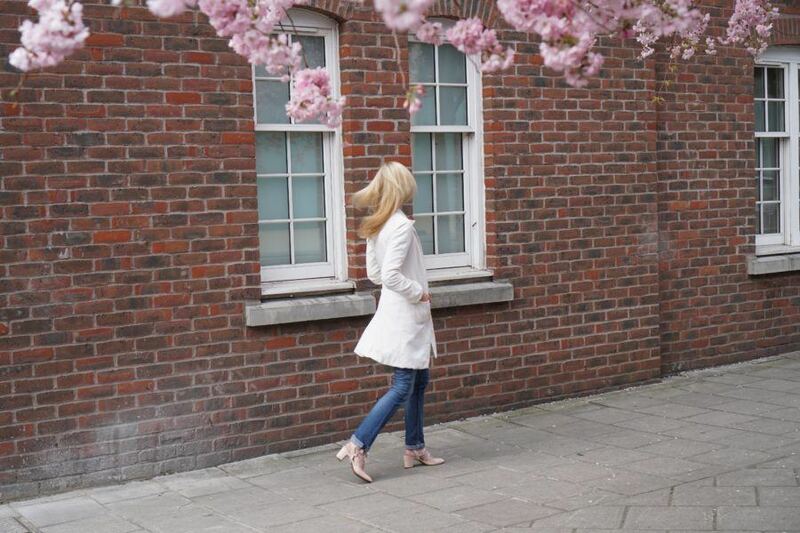 My trench coat is a winter white and it’s the perfect spring coat. I brought it to London in mid-March and worked nicely on 60-70 degree days. 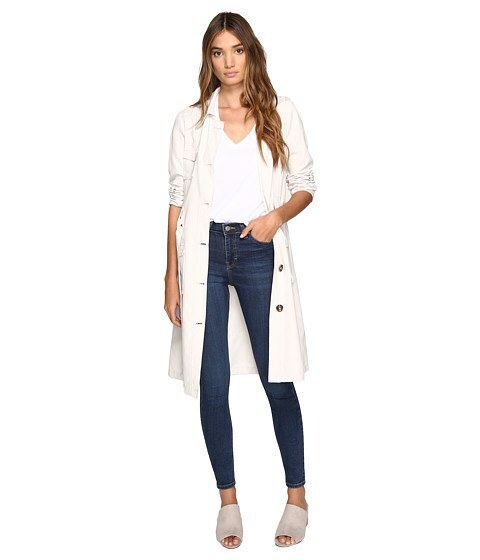 This white trench coat is a total bargain. 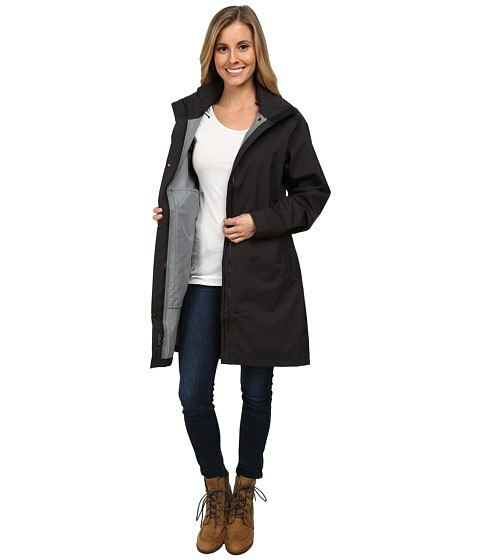 This trench coat is totally waterproof. 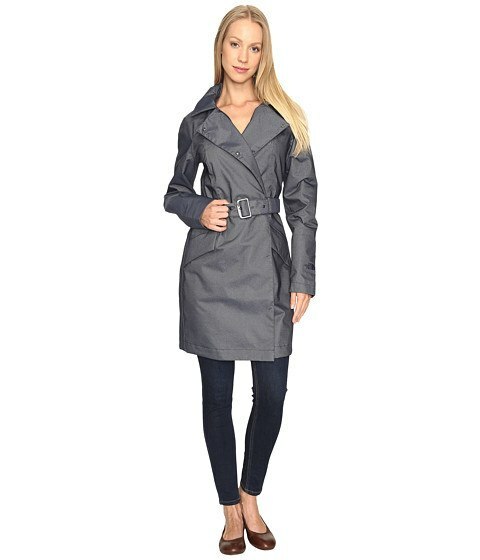 Grey is a great neutral for a trench coat like this high quality one from North Face. Or you can always go for the classic khaki belted trench. My other jacket that always makes my London and Paris packing list is my navy quilted Barbour jacket. Barbour jackets are classic, not trendy– so they never go out of style. I prefer the quilted over the wax as it’s softer, but both are great looking. Absolutely worth the investment, I’ve had mine for years (you can order it here)– it’s a little different from most of the Barbour jackets as it has a slight nip in the waist. There are lots of other great Barbour classic styles to choose from– check them out here. If you wear jeans at home, there is no reason why they shouldn’t be on your packing list for Paris and London. Jeans are practically a worldwide uniform. 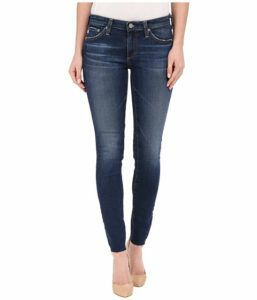 That said, you still want to make sure your jeans are stylish, not frumpy (most of my readers can skip ahead as you probably already own a pair of jeans you love). But if you’re stylistically challenged or haven’t bought jeans in a decade, you might want to rethink your jeans strategy. Look for darker denim jeans with some stretch to them– they’ll be way more comfortable and will hold you in in all the right places. It was a little too chilly for my skirts, so I stuck to jeans most days. 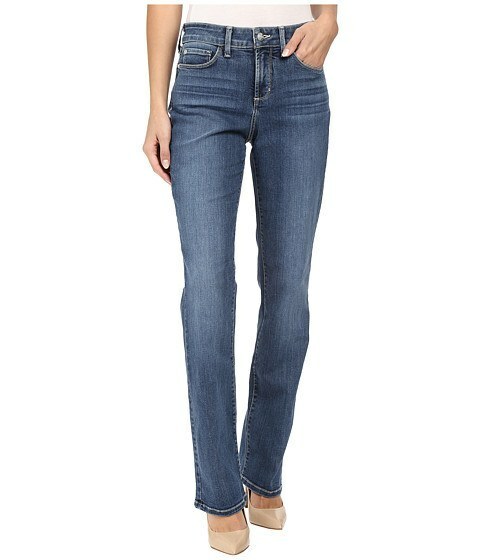 I love AG jeans– these are the perfect shade with subtle whiskering and a nice comfy stretch. If you’re curvier, these jeans are supposed to be a great fit. Travel shoes are a hot topic– you want to look great but you need to be comfortable for all the walking you’ll be doing, stairs you’ll be climbing and of course for navigating cobblestones. Packing travel shoes for Paris and London can be especially challenging because what might fly in a small village might look woefully unchic in a big city capital. 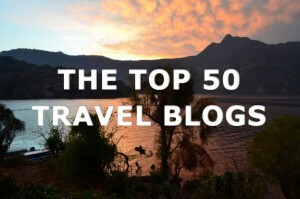 If you want to read all about my top picks for what travel shoes to bring to Europe in the spring/summer, check out my comprehensive post here. Of all the travel shoes I recommend in that post, the one pair that is always, always makes my packing list are my sneakers. You can wear sneakers no matter what your age– it’s all about how you wear them. 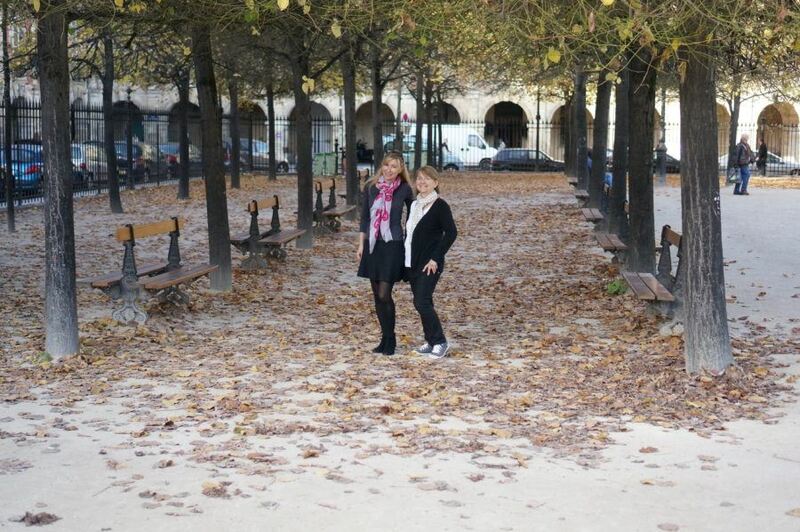 My 67 year old mom looked super chic in her gray sneakers in Paris. 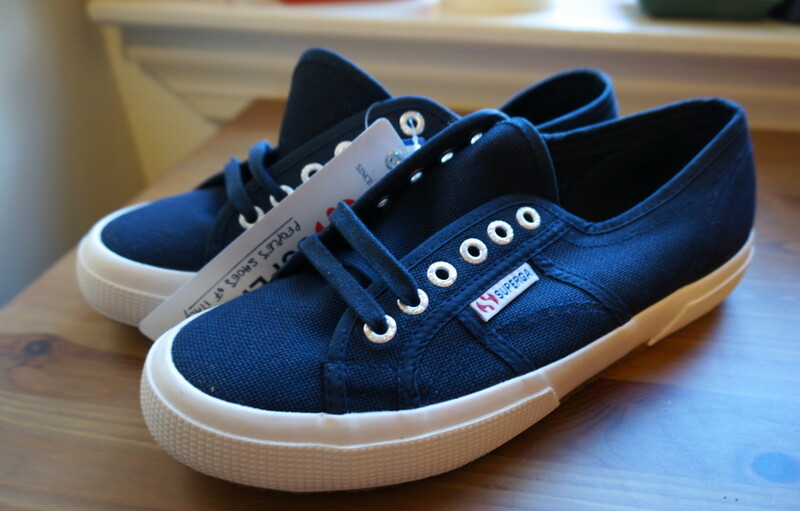 My go to sneakers are my Supergas– I like the navy because they blend in better with jeans. Nothing like a crisp new pair of tennies. If you look back at your travel photos, say five or ten or twenty years from now hopefully you will think nostalgic thoughts, not “god why was I wearing that.” Stripes are as timeless (and French) as they come. 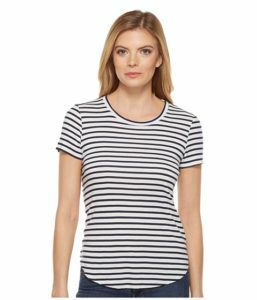 Add stripes to a simple tee shirt and it elevates it and adds a needed pop. 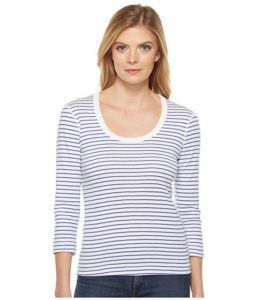 I love this striped top from Splendid– one of my go-to brands. Three dots is another great t-shirt brand– they hold up forever. I hesitated to include a classic button down, because it reminds me of office wear. But, I do sometimes bring them because it can make you feel instantly dressed. This white shirt has a twist— it’s designed for active wear, so it’s comfy not office-y feeling, but sharp enough to wear on the town. I love these super skinny long sleeved tees for layering. They are stretchy and comfortable enough to sleep in but also are perfect for under a cardigan, dress, or even a short sleeve t-shirt to add some warmth and change up your look. They weigh nothing so why not throw them in your suitcase. They’re so soft, that sometimes I end up sleeping in them. I wear these skinny tees back home all the time– for pilates, lounging, napping and out in my neighborhood. If nothing else, you’ll need a comfy cardigan for the flight, because it will get chilly. Cardigans are great as a sub for jackets, or to wear as an extra layer in the evening. 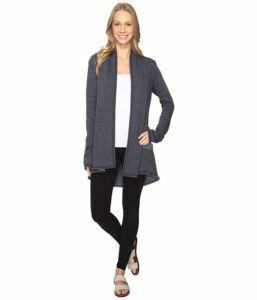 This slouchy cardigan is perfect for flights or as a light jacket. This Splendid cardigan works with everything. As a travel blogger who is also interested in fashion, I’m always looking for ways to improve my shots. So I study the shots of my favorite fashion bloggers, and wonder how I can make them work for me. One thing I noticed in many of the fashion blogger Instagram shots are that they are often wearing heels. And not just any heels, but sky high stilettos. There is a reason for this– heels are leg lengthening and beautiful and they make your photos look great. But as a traveler, I’m doing the same things regular tourists are doing– waking up at the crack of dawn, taking the tube or metro, walking for miles, and sometimes not making it back to my hotel before dinner. It was absolutely impossible for me to wear those stilettos all day long, not to mention horribly uncomfortable, so I never considered that option. But throwing a lightweight pair of heels in my bag and quickly changing shoes for the photo was actually not only doable but ridiculously easy. I tested the heel switcheroo on my last trip to London with a pair of gorgeous Manolo Blahniks. 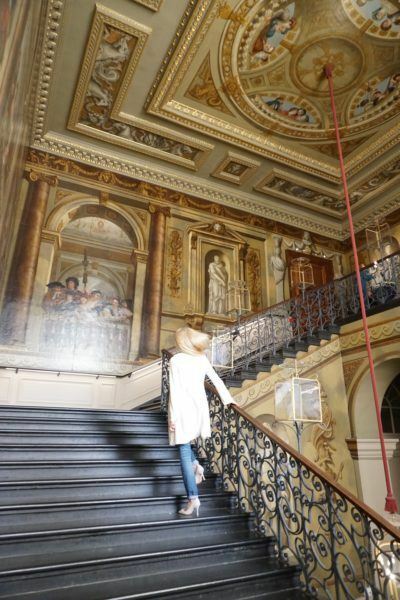 When I spotted this grand staircase at Kensington Palace, I knew it was the perfect place to pull out those shoes. The photos came out so nicely that my friend kicked off her ballet flats and borrowed the heels for her shots as well. Bonus: if you suddenly get invited to a gala (yes it has happened to me) then you’ll already have the perfect shoes to wear. Sneakers felt wrong on the grand staircase in Kensington Palace. My go to “fancy” shoe brand is Stuart Weitzman. These classic shoes comes in eight colors and various fabrics. Though still pricey, they’ll last for years and are way more comfortable than cheaper shoes (and are still only about a third of the price of Manolos). This neutral color works great with either jeans or skirts and dresses. You’ve heard that Europeans love scarves, right? This is especially true in Paris, where I’ve seen both men and women wearing scarves on stifling hot days. 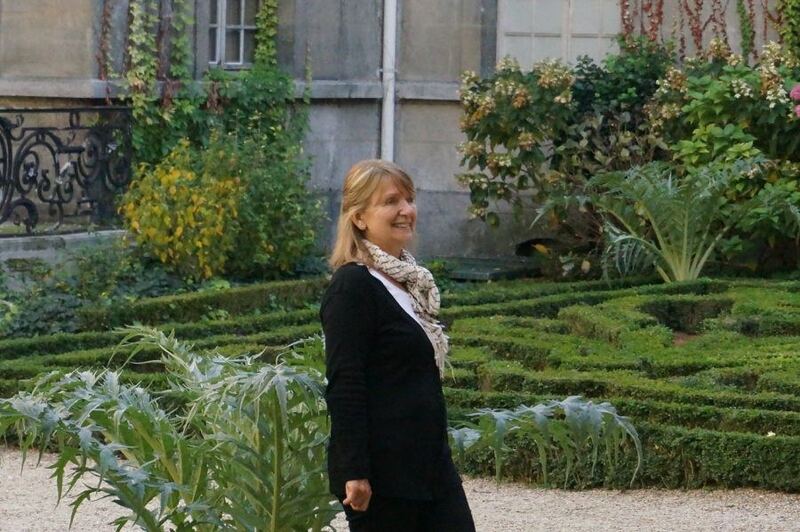 Even my mom (who is wholly unconcerned with fashion) was aware of the “scarf rule.” Wanting to blend in on her Paris trip, my mom picked up a scarf and for her trip. Souvenir Finder’s mom looking very Parisian in her scarf. 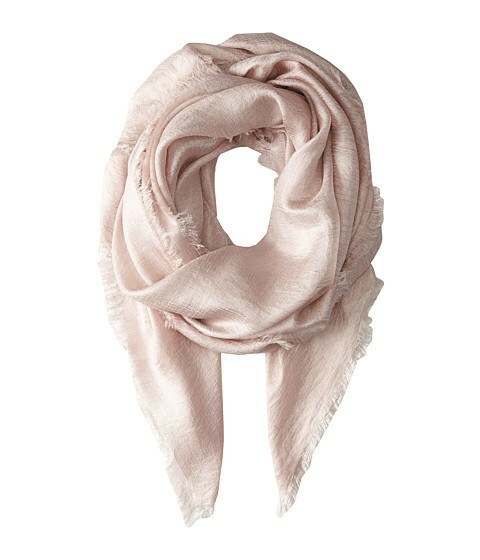 This best selling echo scarf comes in five colors and runs under $40. 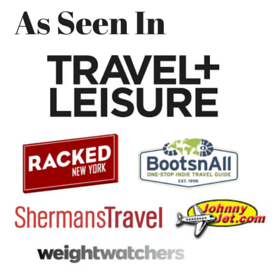 For more of the best selling scarves of the moment, check out my go to site for all travel accessories and clothes, Zappos. What are your favorite things to pack for London and Paris in the spring and early summer? Share your best tips! well fitting Jeans, a stylish coat (I agree invest in a quality one) & if you are over 50 some well fitting not too tight casual tops with 1/2 doz. lovely scarves to change the look. any sort of flat comfortable STYLISH shoe. NEVER joggers or bum(fanny) bags. Sorry no one looks stylish in ugly joggers with a bum bag attached . Hi Dee, thanks so much for sharing! I don’t believe age should play any factor in how you dress, it’s all about what looks best on your body, and I’ve seen plenty of 50 year olds look better than 25 year olds! Haha yes fanny packs are OUT unless you are so chic that you can throw anything on and no one will question it! Scarves are great, my mom wears them when she travels as an easy way to look “pulled together” without having to know much about fashion. Some of this post is equally appropriate for us guys: packing comfy slacks, shoes, jackets, etc. Shorts are OK, even if they mark us Yanks as the “Ugly American tourist.” But if I were staying at a fancy hotel like the Langham or the Mayfair instead of a a 3 or 4-star establishment such as a Double Tree by Hilton, then I might not wear such things in public. I prefer bringing Chinos trousers and New Balance walking shoes, along w/a packable windbreaker and a nice hat. I will also bring my new trusty Rick Steves cross-body bag to carry my essentials.